“The boys used mango and peach juice as the sugar source for the cask refermentation and generously double dry-hopped with Simcoe and Chinook (hops) respectively. And if that’s not enough, we’ll have our Amarilla Gorilla IPA and Hoptonic IPA on tap as well! *Organizers of the fourth annual LA Beer Crawl set for Aug. 10-11 have reduced prices by $5 this year to the event that includes the tasting of more than 100 different craft beers at seven bars and restaurants. Tickets start at $49. Full details here. *The twelve Southern California locations of Lazy Dog Restaurant & Bar are marking the company’s 10th anniversary through Sept. 12 with a collaborative Belgian Blond Ale brewed in association with Matthew Brynildson, master brewer at Firestone Walker Brewing Co. Fans of the India Pale Ale, rejoice! Thursday (August 1) is IPA Day. And Redlands’ Hangar 24 Craft Brewery is celebrating it in a big way. The brewery will be augmenting its current lineup of four IPAs (Columbus IPA, Double IPA, an experimental IPA and the Local Fields Essence) with six more. Claremont Craft Ales is celebrating its first anniversary on Saturday (July 27) and you’re invited to the party! It’s time for the Corona TAPS Fish House & Brewery’s annual Craft Brew Festival. 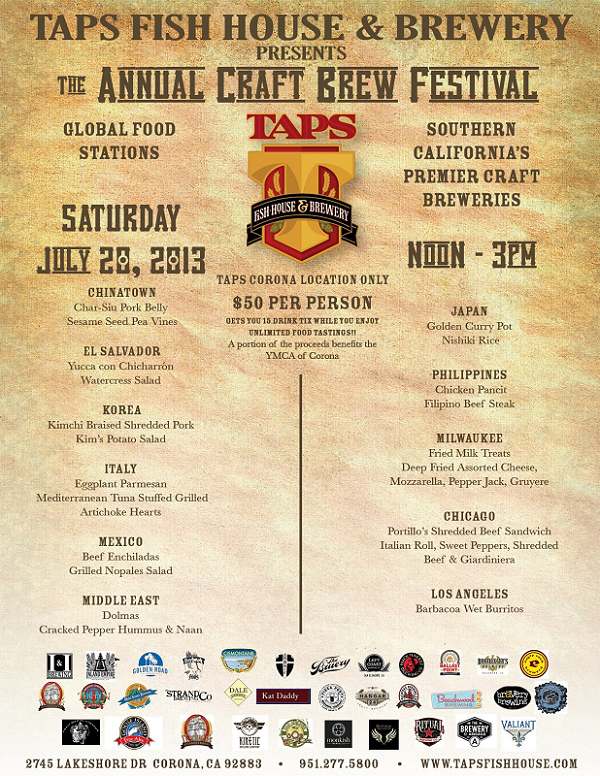 Nearly three dozen Southern California (and one from outside the area) breweries are participating in the event. Beer isn’t the only draw, as participants will be able to sample dishes representative of cuisines from around the world, from Korea to El Salvador and the Middle East to…Milwaukee? Studio City’s Stout Burgers & Beers hosts its inaugural beer festival Sunday — and this one has a bit of a twist, according to the organizers. Sounds good in concept, but I will be interested to hear any feedback from this festival where tickets cost between $60 and $70 a person. That’s pretty steep compared to most beer festivals. I’m sure the organizers will defend the price pointing to the unique nature of the brews being poured. But it’s my experience a craft beer festival focusing on strong ales and other kinds of experimental brews can literally be hard to digest. Frankly, it’s a bit difficult trying to sip your way through what are very often beers that are high in alcohol or have other qualities that don’t make them approachable, session-type brews. Good luck to those of you willing to try, however. Let us know if you got your money’s worth. 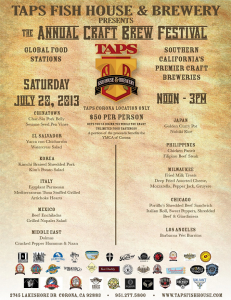 The weather is expected to hit the 90s this Saturday (July 13) in Temecula, but it should be nice and cool inside Pechanga Resort and Casino’s Grand Ballroom, where the casino’s fifth annual Microbrew Festival and Chili Cook-off will be taking place. 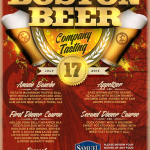 Your $45 ticket includes not only chili tastings from the resort’s restaurants, but a two-ounce taster glass to enjoy unlimited samples of craft brews from Southern California and beyond. It’s not just about beer and chili, though. There will also be a silent auction, with proceeds benefiting Habitat for Humanity Inland Valley, and entertainment by the country/rock band American Made. The event will take place from 1 to 5 p.m. The Rancho Cucamonga Toby Keith’s I ♥ This Bar & Grill is hosting a five-course Samuel Adams beer-pairing dinner next Wednesday (July 17). 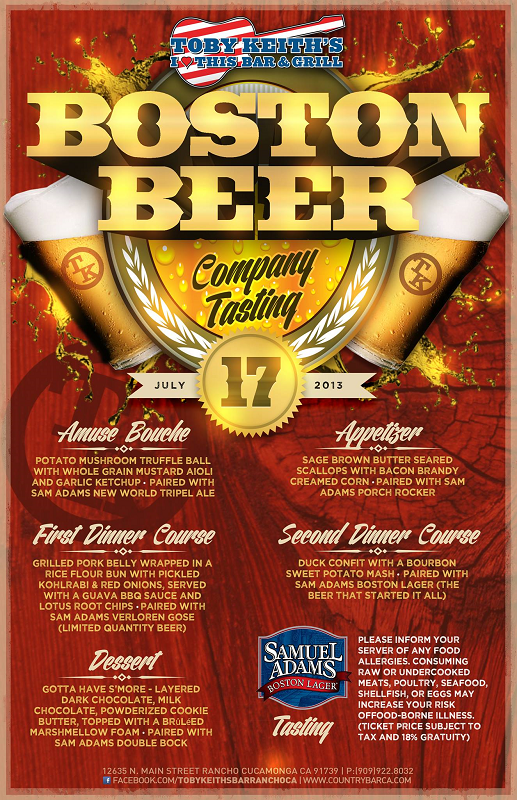 The evening will start at 5 p.m. with a Samuel Adams beer tasting, with dinner following at 6 p.m. The event is $50, plus tax and gratuity. A short while back, the folks behind Sanctum Brewing Co. were successful in raising $40,000 via Kickstarter and are now looking at a fall opening for their Pomona brewery. We’ve found another brewer who’s looking to open a tasting room in Rancho Cucamonga and has begun to raise funds using Kickstarter. Kat Daddy Brewery is offering at least 50% off a flight and a pint for two or four people at its Moreno Valley tasting room via Groupon. Each flight consists of five four-ounce tasters. The offer has timed out and could expire at any moment.